The online version of this article ( https://doi.org/10.1186/s11671-019-2957-3) contains supplementary material, which is available to authorized users. Currently, electronic devices have been experiencing many new challenges, such as compatibility, mechanical flexibility, and eco-friendly manner [1, 2, 3, 4, 5]. Among those, transparent conductive electrode (TCE) as an important component of those devices is also facing new challenges, like high optical transmittance, low resistance, flexibility, biocompatibility , low-cost , and the recyclability . Currently, indium tin oxide (ITO)  is the widely used TCE, which is a continuous and chemically stable film. However, its fragility induced by the metal oxide and the large expense because of rare metal highly limit its future development. On the other hand, graphene/metal grid [10, 11], for example, metal networks [12, 13] and metal nanowires [14, 15, 16, 17, 18, 19], is facing serious adhesiveness and roughness problems. In addition, their high synthesizing cost and the impossibility to recycle make them detained in the laboratory. Figure 2a shows the transmittance (T) versus the sheet resistance (Rs) plots, comparing the optoelectronic properties of the SAN with other reported TCEs [5, 6, 31, 32, 33, 34, 35, 36] and a commercial ITO film (150 nm thick, Liaoning Huite Photoelectric Technology). A figure of merit (F), shown as lines, is determined by fitting the equation in . 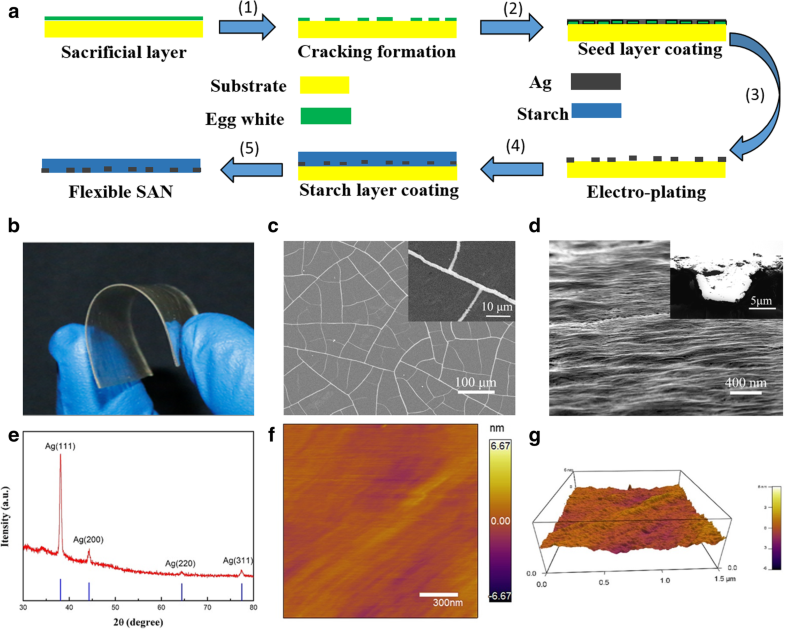 Our SAN shows very good optoelectronic properties with the high transparency (82–93%) and low sheet resistance (0.2–1.0 Ωsq−1, with F ranging from 3000 to 10,000) based on different cracking templates . 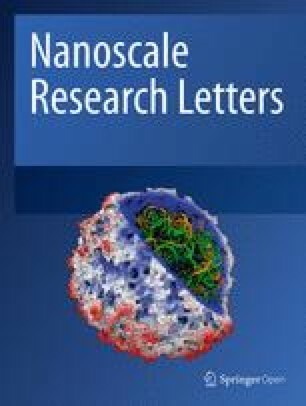 These data are significantly better than those of conventional ITO and other grid TCEs, which could be ascribed to the excellent crystallinity of Ag, the continuous morphology, and the appropriate network structure. Figure 2b shows optical transmittance of the SAN and ITO/PET (150 nm thick, Liaoning Huite Photoelectric Technology Co., Ltd.). It is clear that the optical transmittance of the SAN (~ 93%) is much higher than that of ITO/PET (77~88%) in the entire visible spectrum. Starch is not only a green material and non-toxic for human beings or the environment, but also a biodegradable material, as well as easily removed by water . These properties, therefore, endow the SAN a recyclable material as illustrated in Fig. 3. A piece of used SAN film was immersed into the water (Fig. 3a), and 2 h later, most of the starch substrate was degraded, and water turned into opaque state. The obtained freestanding Ag networks was washed with water to remove residue starch and then transferred onto a piece of a ITO glass and dried in a drying box (Fig. 3b). Figure 3c shows SEM images of the recycled Ag networks. It is worth mentioning that the recycling process keeps the integrity of the Ag networks due to its self-supporting property, rendering the recyclability of the process and finally reducing the overall cost and the environmental impact, comparing with the TCEs based on the non-degradable and non-recyclable plastic substrates [5, 9, 40, 41, 42]. The flexibility of the SAN was characterized under bending in comparison with a ITO/PET sample. The Rs of ITO/PET raised significantly (~ 35,000 Ω sq−1) within a thousand bending cycles (Fig. 4a), whereas the Rs of the SAN fluctuates around 30 Ω sq−1, showing an excellent mechanical stability (Fig. 4a, b). Simultaneously, a periodic fluctuation of Rs was observed when the SAN was bent (from 24 to 38 Ω sq−1) as shown in the inset of Fig. 4b, which is suggestive of its potential application on mechanical sensor [43, 44, 45, 46, 47]. Accordingly, a series of simple joint sensors were designed and fabricated [48, 49, 50, 51]. The SAN with two narrow silver paste lines along edges to give better contact was sandwiched between two pieces of PET films, which was attached on the joint the of neck, knee, elbow, finger, respectively. The motion-dependent response of these sensors was recorded by a two-probe resistance measurement setup. When the joints were in bending stage, the Rs of the sensor changed correspondingly as demonstrated in Fig. 4c–f. When the SAN was under tensile stress at different parts of the body, the output signal varied in a wide range: on the neck, Rs is about 20–30 Ω sq−1 (Fig. 4c), on knee 400–800 KΩ sq−1(Fig. 4d), on elbow 2–3 MΩ sq−1 (Fig. 4e), and on finger 4–8 MΩ sq−1 (Fig. 4f). 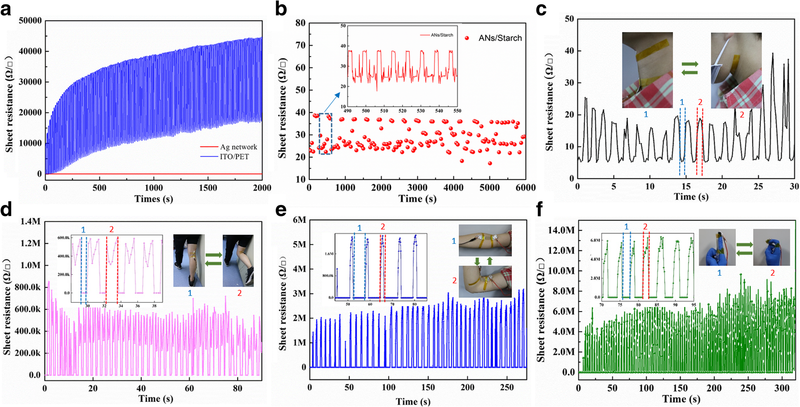 These differences are possibly associated with the magnitude of movement and indicate that the performance of joint SAN sensor are location-dependent .